Everton beat Yeovil Town 4-0 thanks to goals from Lennon, Barkley and Kone (2). Ross the Boss and Kone at the Double. 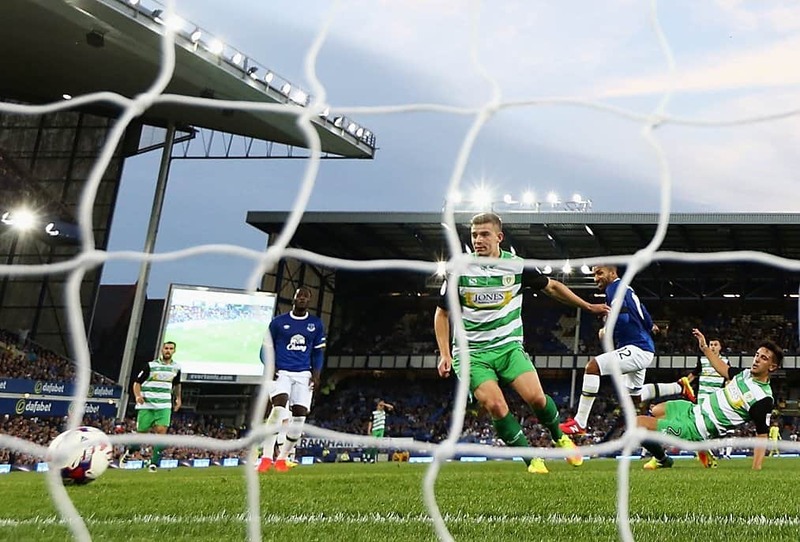 Everton began their EFL Cup campaign with a comfortable 4-0 victory over a plucky and well-supported Yeovil outfit that saw Ross Barkley handed the captains armband in the absence of Phil Jagielka. A first half marker from Aaron Lennon was added to in the second period by a clever, direct free kick shot from Ross Barkley before substitute Arouna Kone bagged a brace that included a shot of raw power for the third. Everton boss Ronald Koeman had promised a strong line up and he duly delivered as follows: Stekelenburg, Oviedo, Funes Mori, Williams, Holgate, Gana Gueye, McCarthy, Barkley, Lennon, Lukaku and Bolasie. Yeovil boss Darren Way fielded his team: Krysiak, Shephard, Smith, Dolan, Mugabe, Dawson, Lawless, Eaves, Khan, Butcher and Hedges. The Blues nearly took an early lead as Lukaku bent a 20-yarder inches over the bar, but the visitors responded by causing a little early panic in the Everton defence before Stekelenburg gratefully claimed the ball. Lukaku was again in the action heading a Barkley corner narrowly over the top and was unlucky that a nice through ball from Bolasie was played just a bit too strongly. The visitors, roared on by their noisy fans, were second best in the early exchanges, but in fairness were far from overawed. Mason Holgate was enjoying himself down the right flank, carrying on an impressive start to the season that will pose Rpnald Koeman a nice problem once Seamus Coleman is fit and available for selection again. Evertons’ third right wing corner almost saw the opening goal as the ball fell nicely for Romelu, but his first time was saved. Another nice feed from Ross gave the big Belgian another scoring opportunity, but this time his shot went wide at the near post. Yeovil having been pinned in their own half for most of the opening 20 minutes got forward and a neat turn from Butcher saw him ping a 20-yard effort narrowly over the bar. A couple of minutes later though and Everton were deservedly ahead as a right flank attack saw some crisp passing involving Ross, Rom and a cross from James McCarthy consummately swept into the net by the hard-working Aaron Lennon on 27 minutes. Having taken the lead Everton, if anything, were a tad too comfortable and began to over-elaborate with one too many passes at times. A surging run by Yannick Bolasie took him into the area and go down, but referee Christopher Kavanagh was having nothing of the former Palace man’s appeals for a spot kick. The interval saw Everton deservedly ahead but it could, and should have been by more than the Lennon strike. Everton had a glorious chance to double their lead within seconds of the restart when a defensive lapse by the visitors presented Lukaku with the sort of chance that should be meat and drink to finisher of his calibre, but he somehow contrived to put a gilt-edged chance wide to the astonishment of everyone inside the Grand Old Lady, not least himself. Bryan Oviedo was next to chance his arm as another flowing move from the right side of midfield to the left involving Rom, Ross and Aaron saw the Costa Rican international rip his shot into the side netting with the goalie well beaten. Lukaku then showed good upper body strength to bully his way past a Yeovil marker to feed Lennon and his cutback to the edge of the box saw McCarthy fire just over. Substitutions began just past the hour with Yeovil sending Campbell on for Khan and then RK sending Darron Gibson and Tom Cleverley on for McCarthy and Holgate respectively. McCarthy had grafted hard while Mason Holgate had had another fine game, particularly in the first half and was perhaps tiring just a little. Everton finally doubled their lead in the 70th minute when awarded a direct free kick some 25 yards out. With everyone expecting a floated ball to the back past, Ross Barkley spotted the keeper had left a yawning gap at the near post and he coolly slotted home with the keeper floundering. Ross had played well, alternating between midfield and getting forward in support of Lukaku and his goal was just rewards for an energetic and busy display on his captaincy debut. Right from the outset, it was plain just how much he wanted to excel and the goal was a fitting reward. Yeovil made another change in Lea for Dawson and Ross got a deserved ovation four minutes later when he was withdrawn to give Arouna Kone a run out. Many Evertonians would like to see the former Wigan striker sold and if that is to be the case in this current transfer window, then the big Ivorian went about jacking up the potential fee. A little over three minutes after coming on, he took a pass from Lukaku, stepped inside his marker and unleashed a howitzer of a shot that ballooned the Gwladys Street goal and brought Goodison to its feet. Three-nil and job done, but Everton weren’t finished. Ronald Koeman has stressed in his programme notes that the win was all-important and his words were well heeded as into added on time, Arouna Kone showed great persistence and hunger to win the ball and stab it home from six yards to complete an eleven minute double. Lower league opposition have often been difficult times for the Blues in recent seasons and the margin of victory was a very welcome sight for a decent summers evening crowd. Ronald Koeman gave home debuts to Ashley Williams and Yannick Bolasie. The Welsh captain is a strong, no-nonsense defender and a couple of wayward passes apart was fine. Bolasie showed some nice control, power and pace, particularly in the first half, but will probably be a little disappointed with his second half showing. The manager also afforded himself a short look at Gibson, Cleverley and Kone, whose goals will have delighted him. Some fans may have been surprised that Joel Robles wasn’t given the start in goal, but Ronald Koeman seems keen on getting his starting players fully match fit rather than rotating the squad purely to satisfy others. Watching him in the technical area, Koeman does not appear to be a manager to be trifled with as he is not shy of admonishing and even berating players when they don’t do what he wants and expects them to do. He will however surely have been pleased with the performances of Ross Barkley and Aaron Lennon who would be a decent selection for MotM. All that said, the first potential cup banana-skin has been comfortably avoided, we’re in the hat for the next round and we’re unbeaten in three games. Onwards to Saturday, the visit of Stoke and who knows who in more transfer window activity. One footnote that has been raised elsewhere on the forum is the extremely annoying late arrivals to the game and especially those who then stand in the aisles looking at their tickets to see where they should be sitting. There was so much of it in MS2 tonight that my normally placid missus was disposed to yell “Shift yerself” at two blokes and they rather quickly took their seats.